rec. Church of SS Peter and Paul, Salle, Norfolk, England, 1990 (Cardoso), 1992 (D Lôbo), 1997 (A Lobo); Church of St John, Hackney, London, 1987 (Victoria) DDD. rec. Church of SS Peter and Paul, Salle, Norfolk, England, 1992. DDD. This review is the fuller version which I promised in my February 2009 Download Roundup. It’s especially for the benefit of those who haven’t yet discovered my monthly download roundups. I stated in a review of Duarte Lôbos 8-part Requiem on Helios (Masterpieces of Portuguese Polyphony, CDH55138) that CDGIM205 contained the same 8-part Requiem and CDGIM028 the other, 6-part Requiem. Both recordings are, in fact, of the 6-part work and, thus, neither competes with the Helios. CDGIM205 offers a two-for-one set of the Lôbo, Cardoso and Victoria Requiems, plus music by Alonso Lobo, and CDGIM028 has the same recording of the Lôbo coupled with the same composers Missa Vox clamantis. Both are available to download from the Gimell website; I can vouch for the high quality of the CD-equivalent wma version. Far from duplicating any item on that Helios CD, either of these versions of Lôbo’s more mature six-part Requiem should be your next port of call if you followed my advice to buy the Helios last year. If not, you could purchase it alongside either of these Gimell CDs or downloads and still have change from £20. Downloading the Gimell will save even more – but don’t dream of paying £7.99 to download the Helios from iTunes, when you can buy the CD for just over £5. 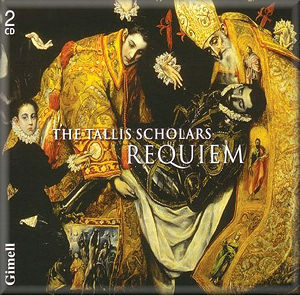 While the Lôbo Requiem appears on both Gimell sets, the chief attraction of CDGIM205 for most purchasers will be the Victoria Requiem and here the Tallis Scholars face some stiff competition from The Sixteen/Harry Christophers on Coro, the mp3 version of which I made my Download of the Month in October 2008. The CD equivalent is actually an SACD (CORSACD16033). For many Victoria’s Requiem is a quintessential work of the Spanish renaissance. Don’t look for the dramatic power of the Mozart or Verdi Requiems: with only parts of Dies iræ set here, the overall mood is one of tranquil grief and quiet hope – a mood which Fauré and Duruflé were to capture again in their settings and to which both The Sixteen and The Tallis Scholars are well attuned. Everything comes together on the Coro CD: music, singing and recording. The performance seems just right – moving the music along at quite a brisk pace yet allowing space for contemplation and never sounding hurried. The instrumental accompaniment, where it occurs, is discrete and unobtrusive; it includes the use of the bajón, one of the ancestors of the bassoon. The recording, too, even in ordinary stereo, sounds excellent. There isn’t a great deal of difference between the Coro and Gimell recordings. The Sixteen sing the music noticeably more briskly throughout, thereby creating swings and roundabouts. This is, after all, a setting of the Mass for the Dead, so The Tallis Scholars’ more reverential tempi are certainly appropriate; on the other hand The Sixteen may be thought more attuned to listeners of the present day, without destroying the dignity and beauty of the music, since 21st-century life moves at a greater pace than that of the early 17th-century. As so often, timings mean less than the overall quality of the performance, though I mention them out of interest; both versions have the power to transport me – the Gimell never drags nor does the Coro ever seem unduly hasty. Both discs are well filled and well recorded: the wma version of the Gimell is fully the equivalent of the CD and there is also a less expensive 320k mp3 version, which I have always found to be more than acceptable from Gimell. The Coro will be essential for those who must have surround-sound or who want only the Victoria; it also comes as an mp3 download from eMusic, classicsonline and theclassicalshop, in 320k format in the last two cases. theclassicalshop will provide the Coro booklet, too, with very informative notes, texts and translations. The Gimell version of the Victoria also comes on a single CD (CDGIM012) but, with the sole addition of the 3-minute tædet animam meam to the Victoria offered on CDGIM205, and an overall playing time of only 47 minutes, it hardly seems competitive. The Sixteen also offer tædet animan meam – they are actually slightly slower than The Tallis Scholars here – and several shorter pieces by Victoria, including an affective performance of the funeral motet Versa est in luctum – slightly faster than the Oxford Camerata on Naxos, but equally effective. That Oxford Camerata CD, on Naxos 8.553240, offers good small-scale performances of Victoria’s Missa O magnum mysterium and Duarte Lôbo’s 1621 8-part Requiem Mass, i.e. the one on the Helios CD, not the one performed on Gimell. An alternative coupling entitled Portuguese Requiem Masses (8.550682) offers the same 1621 Requiem coupled with Cardoso’s of 1625 – i.e. the work offered on CD2 of CDGIM205 – a tempting bargain except that the 2-CD Gimell set costs less than the price of two Naxos discs. I can see that I’m painting myself into a corner from which I can escape only by recommending that you buy or download both the Coro and Gimell recordings or, at the very least, the Coro Victoria and the Gimell single-CD Lôbo, which may seem an unreasonable recommendation in these economically straitened times until you calculate that the 16 tracks of the Coro from eMusic will cost you less than £4 (£7.99 from theclassicalshop or classicsonline; £6.99 in 256k sound from amazon.co.uk) and the mp3 version of either Gimell recording just £7.99 for mp3 or £9.99 for CD-quality. I’ve concentrated on the music on CD1 of CDGIM205, but that by Cardoso and Alonso Lobo (no relation) on CD2 and the performances of it are equally desirable, very well sung indeed and excellently recorded. The Naxos version of the Cardoso – like The Sixteen’s Victoria, generally slightly faster than that of The Tallis Scholars – is very good but the Gimell has the edge and the Naxos omits the concluding Responsory Libera me. Both sets of Gimell notes, by Peter Phillips, are informative and readable. Both sets come with full texts and idiomatic translations and the full booklet and artwork are available also to download and print out. As usual, both Gimell booklets have appropriately and attractively illustrated covers – the 2-CD Requiem with El Greco’s Burial of Count Orgaz, the single Lôbo CD with Zurbarán’s Funeral of Saint Bonaventure. The employment of the El Greco is especially appropriate for a set containing Victoria’s Requiem, since both were foreigners employed in Spain and both had their names altered: the Italian Vittoria’s name was easily adapted but poor Domenikos Theotoukopolos became first Il Greco, ‘the Greek’, in Italy and later El Greco, a combination of the Spanish definite article and his Italian nickname. My only complaint about these two Gimell issues is that the real enthusiast will buy both and end up with two versions of the same performance of the Lôbo Requiem but the inexpensive 2-for-1 nature of CDGIM205 partly makes up for that. Buy the 2-CD set by all means, but I wouldn’t willingly forgo the beautiful Missa Vox clamantis on the single disc. At the same time, I can’t resist mentioning the virtues of an older recording by The Sixteen from 2002, of motets and hymns by Victoria, The Call of the Beloved (COR16007), which Jonathan Woolf has already dubbed a marvellous disc – see review. Add to either version of the Requiem this recording of Victoria in more festive mode, the Tallis Scholars’ recording of the Tenebræ Responsories, on Gimell (CDGIM022 – also available to download) and one of the Hyperion Westminster Cathedral recordings, and you have the makings of a first-class collection of Victoria’s music. If you’re looking to extend your acquaintance with Duarte Lôbo or Manuel Cardoso, try Queen’s College, Oxford, directed by Owen Rees in Lôbo’s Missa de beata Virgine (Cæli Porta, Guild GMCD7323 – see my recent review) or their earlier recording of Cardoso’s Missa Paradisi Portas (GMCD7296 – see Glyn Pursglove’s review), both coupled with other 17th-century Iberian music. 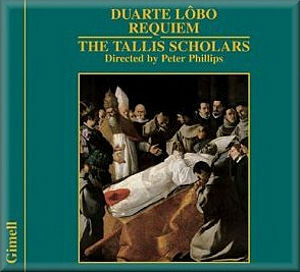 Nevertheless, it’s the Requiems and the associated music on the 2-CD set which appeal most. If the purpose of the Requiem Mass is to assist the soul’s passage to heaven, all the recordings of the late flowerings of the Iberian Requiem mentioned in this review certainly achieve that metaphorically.